Neighbors, Can You Spare $300 Grand? Sue Kullen, left, pitches the Celebration of Life Cancer Crusade to Elaine Koogler, of Owings, at the North Beach Farmers’ Market. What’s left after 1,000 pounds of lobster are washed down with champagne? Or if you prefer, a roasted pig is washed down with beer? Or filet mignon washed down with martinis? A third of a million dollars  if Calvert County’s biggest party, the Celebration of Life Cancer Crusade, lives up to the tradition of past celebrations. And if Sue and Steve Kullen, this year’s honorary chairs, are as good at reaching into your heart and pockets for this year’s Aug. 5 party as past chair people have been. The partying started back in 1982, thrown by brothers Gerald and Fred Donovan. Now in its 29th year, The Celebration of Life Cancer Crusade is huge, drawing hundreds of benefactors to the Donovans’ Chesapeake Beach Resort and Spa at Rod ‘N’ Reel for a night of abundance  eating and drinking, dancing and mingling  for a good cause: Raising big bucks for the American Cancer Society’s cancer research and support programs. Over the years, partygoers have donated close to $4 million. 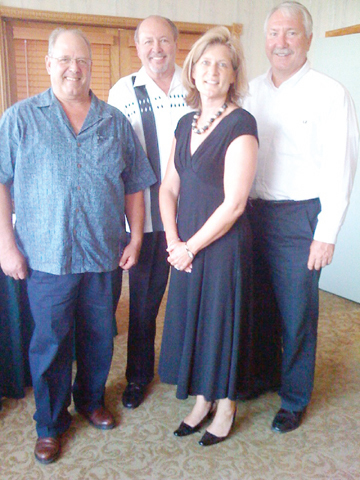 Cancer Crusade founders Fred and Gerald Donovan, left, with this year’s honorary chairs, Sue and Steve Kullen. Reaping this many millions is hard work. Doorbells need ringing, businesses need calling and friends rallied for their support. Knowing they couldn’t do it alone, the Donovans asked Judge Perry G. Bowen to be the first honorary chairperson and help with the job. Twenty-eight years later, there are even more businesses, doorbells and friends as potential donors. It’s an honor to oversee, but also a monster of a task. This year, the honor  and the job  fell on the shoulders of Sue and Steve Kullen. The list of past honorary chairs is impressive with immediately recognizable names. There have been politicians: Bernie Fowler, Louis Goldstein, Steny Hoyer, George Owings, Mike Miller. Celebrities, like novelist Tom Clancy. Business people: Johnny and Connie Gott of Gott Oil and local Fast Stop convenience stores; Phil and Jeannie Stone of Stoney’s seafood restaurants; and last year, Mike and Sara Middleton of Tri-County Bank. And community activists: In 2008, county newcomers Bob and Pat Carpenter tapped into their Rolodexes. Not everyone has jumped at the chance to serve. “I’ve been turned down a few times because it is a lot of work,” Donovan says. In March, snow still on the ground, the Donovans approached the Kullens. The Kullens did not hesitate  at least visibly. Her only concern was the amount of work that came with the honor. Being honorary chair is more than photo ops and the occasional meet and greet. And this year, Sue is busy with another big job. It is an election year, and Delegate Kullen is hard at work on her campaign to be re-elected to the Maryland General Assembly. This is the first time either Kullen has worked as honorary chair to anything. 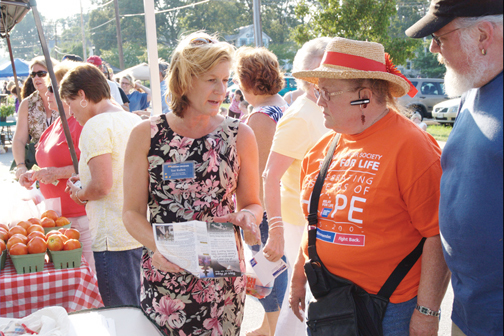 As a state delegate, Sue has lent her hand to smaller events, but the Cancer Crusade is the biggest. Steve is a complete, albeit enthusiastic, newbie. 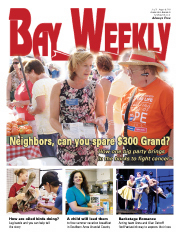 Their informal goal is to best donations from last year’s Gala, in the $300,000s. That’s a lot of money, especially in our economy. All the work it takes to pull off Calvert’s best party is donated. After expenses  the wholesale cost of food and drink plus the aerial spotlight to draw all eyes to Rod ’n’ Reel  all money from sponsorships and tickets goes to the American Cancer Society. 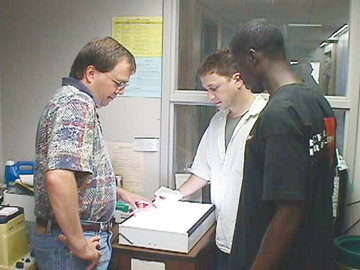 Cancer researcher David Weber, shown here at left in 2003, studied patient-specific drugs with a grant from money raised at the Gala. Forty percent stays in Calvert to support local American Cancer Society programs, including Wigs, Scarves and Turbans; Reach to Recovery; I Can Cope; Look Good Feel Better; and Man to Man. Also funded are college scholarships for survivors of childhood cancer and patient advocates to cancer-stricken families with loss of income, lack of health insurance and the emotional impact of the diagnosis. The remaining money raised by the Gala supports the American Cancer Society’s ongoing cancer research, much of it in Maryland. The Kullens’ big job began with team-building and regular meetings. The Gala team of 20 includes staff and volunteers from Rod ’n’ Reel along with friends of the Kullens. In one of the first meetings, the Kullens got a list of previous sponsors for the last five years. Sue’s “red letter day” brought in $39,000. Working the phones is only one way of recruiting sponsors. As keynote speaker at the Calvert Chamber of Commerce’s Women to Women event, Kullen asked her audience for support. On the two Fridays before the Gala, both Kullens sold tickets and memorial luminaries at the Friday night North Beach Farmers’ Market. Besides donations, the Kullens are bringing new ideas to the grand old event. Hine’s idea is to represent the types of cancer with colored ribbons. Ribbons in three dozen colors will be handed out by the American Cancer Society at the reception table. The Kullens will wear several different colored ribbons in honor of “way too many” friends who have suffered the disease. One will be for Bard of the Chesapeake Tom Wisner, killed by lung cancer in April. Steve’s story is closer still. He was eight years old when he lost his mother to breast cancer. Steve’s loss intensifies their motivation to find a cure. “No little boy should grow up without his mom,” Sue says. The year Perry Bowen chaired the Donovans’ first gala  1982  Steve and Sue left their native Pennsylvania for Calvert County. Their first home  and job  was as a live-in couple at a group home built by the Arc of Southern Maryland on Broomes Island Road. Sue worked full-time with the Arc for almost 14 years, leaving as the director of planning to start her own consulting business. Steve, meanwhile, worked for Calvert County, helping develop the county’s comprehensive plan and its recycling initiative. He’s now a county environmental planner. The Kullens settled in Governors Run, where they manage a cottage rental business. Sue still works as a consultant in the field of disabilities when she’s not working as a legislator. They see themselves as ordinary people, neighbors among neighbors. One of the Kullens’ goals this year is to get those citizens to return to the Gala, bring their friends  and make new ones. As Calvert County has grown in population, the sense of a tightly woven, small community has been diminished. Many people leave the county five days a week for jobs in the city. Evenings and weekends are full of tasks demanding attention before the next Monday morning commute. Reconnecting the community is the Kullens’ personal goal. Respectful and grateful as they are for the generosity of business owners, Sue and Steve want to make the gala of 2010 a neighborhood bash. So as Sue works the phones, Steve takes on the 2010 version of door-to-door sales. Harnessing every email address on his home computer and posting status notices on his Facebook page, he is asking everyone Hey, are you going to the Cancer Gala? Have you bought your tickets yet? The Kullens want you to know that you are invited, that you will be their honored guests. They believe that if they call you, you will come and support the cause, support the community. In turn, you’ll be rewarded with one heckuva block party. The Gala is about abundance of good food as well as abundance of good will. You’ll feast on piles of Maine lobster, shrimp, oysters, clams, mussels, crabs and fresh fish, as well as roasted pig, filet mignon, barbeque ribs, grilled chicken, steamship round and desserts galore. Wash it all down with beverages from the open bar, and work off the calories by dancing to live music. © COPYRIGHT 2010 by New Bay Enterprises, Inc. All rights reserved.